wonderful article with sharp sample. I can't help commenting after read this. Good job, carry on Bhante ! Venerable Kusalasami was born in 1981 at Pyawbwe Township, Mandalay Division. He was ordained as a novice at the age of 14th. From 1995 to 2001, he studied primary and elementary Buddhist education at several famous monasteries in Myanmar; Visuddharama monastery (Taungoo Township), Kankalay forest monastery (Oak Twin Township), Brahmanimmitarama monastery and Nyaung Tone Pali University (Yangon). At the age of 21st, he was ordained as a Buddhist monk. In 2001, he passed the entrance examination and joined State Pariyatti Sasana University which is situated in Kabaraye hill, Mayangone Township, Yangon; in which he studied higher Buddhist education; B.A and M.A. In 1st and 2nd year, he passed with all distinctions in all of seven subjects and obtained 1st price. In 3rd year, 3rd price and final year 1st price again he finished successfully with flying colors. Within his education period, he sought many scholarships from that University. In 2003 as a student of State Pariyatti Sasana University, he set Sasanadhaja examination held by the Government and passed. That’s why he is awarded Sasanadhaja Dhammacariya degree which is equivalent to B.A by the Government. In 2008, he went to Sri Lanka and joined Buddhist Study of Kelaniya University where he obtained M.A degree. After finished M.A degree in Kelaniya University, he entered the Cittalapabbata forest that is second biggest forest in Sri Lanka and pracitsed Buddhist meditation in the cave for 60 days. 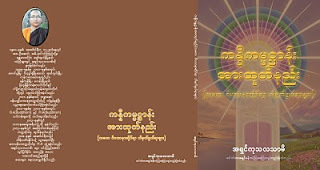 Then he wrote a book in Myanmar language about his meditation experiences. Now he has already written many articles and published four books. In 2010, he was invited by Dhammikarama Myanmar Chinese Buddhist Temple in Penang, Malaysia where he taught Buddhist meditation for one year. In 2012, he backed to Myanmar and established Dhamma School Foundation. As a general secretary of foundation, he opened hundreds of Dhamma School throughout Myanmar. In 2014, he was invited by Myanmar community in Frankfurt, Germany. Now he is teaching Buddhist meditation, Abhidhamma and other basic Buddhist knowledge in Germany. Anyone who are interested to join 2nd European Buddhist Youth Forum click the below link and read carefully. If you agree all mentioned there, can fill the form and apply. Theravada Dhamma MP3s, eBooks, Dhamma Songs, Videos Many More! !